The FT says this is worse than feared, and I say it is just what I was expecting (see here, I do hope that doesn’t make me one of those “visionaries” you are all so busy talking about). Germanyâ€™s economic slump in the final quarter of 2008 proved worse than feared, official figures showed on Friday, with the country posting the sharpest fall in gross domestic product since the country was reunified in 1990.The larger-than-expected 2.1 per cent plunge in GDP in the final three months of the year showed Europeâ€™s largest economy contracting at a faster pace than the UK in the same period and threatening to drag down the performance of the 16-country eurozone. A 2.1% quarterly contraction, for those who are confused by the way we economists do things is equivalent to an 8.4% annualised rate of contraction, which is quite something (although in fairness some of this comes from Q3 when there was a big build up in inventories, which has now unwound). But the real question, when all the dust settles, is going to be why it is that economies like those in Germany and Japan are so incredibly export dependent (remember, all those “decoupling” arguments which were so in fashion not so long ago). My view is “its the demography silly”, but then we can’t go back 30 years and change all that with the wave of a wand, so we really don need some out of the box thinking on the global imbalances soon (see Claus’s arguments in his last post). Meantime the EU are working furiously away on the next “top secret” European bank bailout proposal (does this have anything to do with the unexpected rapid departure of Michael Glos last weekend? – all of this was most strange, see here). Details are sof the coming bank bailout proposals are still scarce at this point, but the excitable Telegraph do come up with a very hair-raising number (16.3 trillion pounds, see here). As I have been arguing, far from Germany subsidising the rest of the EU, Germany may well be at the heart of the bailout, needing support from the rest of us, which is why we need EU bonds, and we need them now. United we stand, divided we go down the plughole! And if you have any doubt about the export connection, just look at the chart below, not an exact fit, but an obvious close correlation. Germany needs a demographic fix, simply going for longer shopping hours (and the like) won’t work in a case like this. 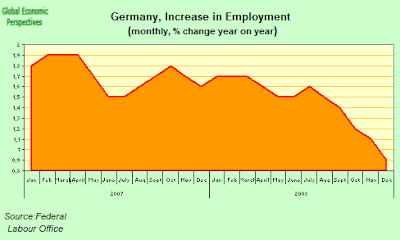 And as for labour market reforms, just look how many jobs Germany created this time round. Hugh, donâ€™t get me wrong. 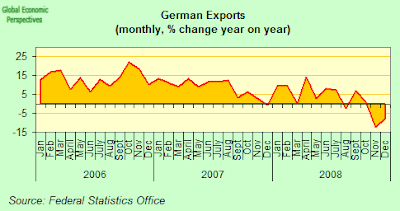 You are curious why Germany economy, ticking tenths of billions of dollars per annum in trade surplus in last 7 years, is contracting in last two quarters? 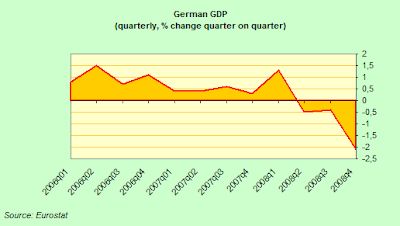 Lets bring Germans economic problems back to street level. Their big automobile-industry is one of the pillars of the German economy. Nowadays the media are filled with reports about the decrease in the selling of cars. With their back against the wall, the dealers are forced to lower their prices. Germany produces mostly the more expensive type of cars, so a little percentage of drop in the price means for the consumer an saving of a few thousand euros. Therefore a lot of potential car-buyers are WAITING a bit more, hoping for a further lowering of the prices. WAITING is not cancelling, it just means that customers are driving in their old cars a few months longer. But the longer they wait, the more damage is done to Germans automobile-industry. They have to reduce their production, therefore they dismiss personnel. The dismissed personnel has less money to spend, and therefore buys less products. This causes others companies to reduce their production volumes, and to dismiss personnel. Etc, etc, itâ€™s the well-known downward spiral. But it did not necessarily have to be this way. Interesting was what happened in Japan during their economic crisis during the 90th. Here, facing the same difficulties, the companies refused to dismiss their personnel. This measure did not prevent an economical crisis, but it did worked on the economy like a kind of shock absorber. Donâ€™t worry, I havenâ€™t gotten you wrong, but the point is that to fix this they are going to need to fix their population problem, that is, there is no short term solution to this, they are on a giant see saw that keeps swinging ever more violently up and down, until of course the day it doesnâ€™t. Chance would be a fine thing :). This is a labour of love, and becuase if I didn’t so something in the face of all this, then I just wouldn’t feel right. It is such a priviledge to be alive right now, so much to learn, so much that those who went before us couldn’t see because they didn’t have the information or the historical vantage point. That is why they were greater than us though, since they were able to do so much with so little, while we are able to do so little with so much. Just look at the mess that is going off out there. Well there you have it Ron, in the space of a short sweet sentance, what the problem is with deflation, as prices go down and down and down, people postpone and postpone and postpone. Not the same people, mind you, but on the aggregate this is the ripple effect you get. Of course, at the present time most of the contraction is due to credit deleveraging, and at some point that will stop, and then in contries like Germany, where we can really get stuck in the mud of deflation, this can go on and on for many years like in Japan. So, getting the vegetable patch ready yet are we? This weekend could be a good opportunity to give the soil a quick spade-over :). The massive bailout that I donâ€™t think you really want is coming in about two weeks it seems (or at least the details are), but my feeling is that this is now already too late (needs to be done, but wonâ€™t stop the mess) and that they will be closing the gate after the horse of deflation has already bolted. Haha, me skiing? Well, only maybe some aprÃ¨s-skiing. But I am planning to go to south-east Europe (Bulgaria, Romania, Moldavia, Ukraine) at the end of march, for leisure and to look for a good opportunity to eventually buy some real estate. Or should it be wise to putting this journey on hold also? No, go and enjoy yourself, and decide where you would like to buy, but my advice is hold off a couple of years on the purchase, and you will probably get a better deal. eg the Lev peg may well go at some point, and all these economies are going to have a very hard time. But don’t buy if you are expecting big price rises, since you will probably be disappointed, only buy for love. That is the name of the game now. Regarding deflationary tendencies, what’s your opinion on incentives like Germany’s car scrapping subsidy? Should perhaps sales taxes be lowered for a short, predetermined period of time? I quote this not to advocate protectionism, but to argue that we are all in a really complex situation (see my posting of Claus Vistesen’s piece). Incidentally, Michael Glos’s resignation. Could this be to do with the coming EU bank bailout? Do you have an opinion on this? But you don’t explain anything about ‘demography’. I have no idea what the hell you’re talking about. Could you explain a bit? Rising median ages Pamela, rising median ages. Basically years of ultra low fertility coupled with relatively unfriendly immigration attitudes means that the median age of the Japanese and German population (at 43) is now the highest on the planet. Previously it was assumed that we wouldn’t see much in the way of economic consequences from all this till much later in the century, but now, to me at least, it is obvious those consequences are already here. Basically they reveal themselves in very weak domestic consumption growth, which means that economic growth (which is needed to pay all those pensions and health care costs) is totally dependent on exports, and hence the economic well-being of others. Thus, while both Germany and Japan had no housing bubble, or excessive consumer borrowing (in fact they were huge net savers, running large current account surpluses) their economies have folded much more quickly and much more dramatically than the rest. In addition their banks (and in particularly Germany’s) have lost large chunks of those savings financing others housing booms (the US, Spain, Ireland, Eastern Europe etc). This is now the second time this has happened, since we saw a much weaker version of the same phenomenon after the internet bust in 2001. But each cycle this gets worse as the median age steadily rises, and I can’t imagine it is exactly pleasant for the Germans and the Japanese who haver to live through it. So before these tow countries finally fall off there perches altogether I suggest it is time to do something, in the short term via encouraging immigration, and in the longer term by fomenting much more child friendly policies, making it much more attractive for those women who want to do so to have children, even if this comes at the cost of the welfare and pensions funding of the elderly. At this stage in the game their societies have precious little choice, and if they do nothing the long term future of these societies is obviously in jeopardy. Edward, thanks for taking the time to comment. My question would be that of the first two examples you cited, Germany and Japan, even with problems in birth rates and ages, neither were especially consumer oriented to begin with. Japan in particular has mentioned to avoid some of the current problems, notice I said some, by increasing domestic consumption. Though long term I agree that they will have problems though inflation could bring some overseas money back into the country. By spending savings, which get a miserable return, the Japanese banks will have to increase interest rates and make Japanese investment more attractive. While I agree that Germany has a much more daunting problem in its low birth rate, miserable return on personal savings and the continued structural bias towards exports but the one thing Germany can do that Japan probably won’t is to allow more immigration and loosen the current laws concerning naturalization. It would be exciting as heck for maybe one generation but all one can do is look to the Old Southwest and California to see that, aside from nativists and those that have trouble ordering tacos, the influx has been successful. Though the economy here is a shambles it should be obvious that it is not the fault of the immigrant in an entry level job. So since Germany can react to a decline in population and Japan won’t how can either country create enough internal demand to weather the current downturn? Also do you think that the Porsche and Piech families are praying by some miracle that they can figure out a way to get rid of Volkswagen and wishing that they are not introducing the new sedan, the Panamera, at a time when sales are off some 22% in the US? The simple answer is they can’t, since the high levels of elderly dependency which are about to arrive, and (in the case of Japan) the already high state indebtedness exclude the kind of “heavy duty” stimulus package that Obama is introducing in the US. Apart from France and the UK most EU countries will struggle with this order of spending, and we haven’t got to the second round in the bank bailout yet. So all they can do is grin and bear it, and wait for the global economy to pick up again. And when this is all over, my guess is that a big part of Eastern Europe will have joined then in the same predicament. That is, next time round expect the “global imbalances” to get even bigger. Solutions? I have no solutions. At the present time I am simply trying to document things as they happen. Regarding Glos and his resignation I think that if it were based on political disagreements he’d have gone quietly. But the public scandal he inflicted on the party makes me think he had personal reasons. As long as a government has command of its currency, can’t it make saving extremely unattractive?